For two thousand years, a core tenet of Christianity has been that, to paraphrase John 14:6, Jesus is the way, the truth and the life – no one comes to the Father but through Him. The eternal reward of Heaven is exclusively for those who repent, put their faith in Christ’s sacrifice on the cross and asked to be saved from their sins. 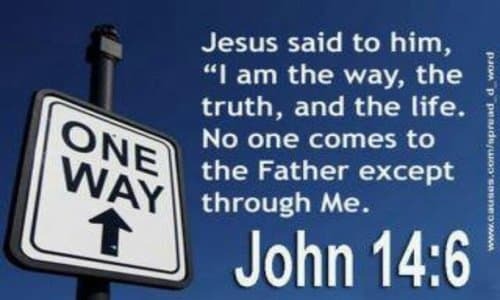 He did not bother to cite the precise verses of scripture where Jesus tells His followers that there are other paths to God and that He is not the only way or the only truth. But it is likely that he didn’t need to in order to sway his audience, because the pastor, and others like him, are tapping into a powerful in postmodern and liberal theology in which Christians no longer believe in the traditional view of Christ’s sacrifice and its value. Pluralistic notions of religious relativism and vague spirituality have resulted in a stark difference between traditional Christian doctrine and the now common belief that Christ’s sacrifice is just one method of salvation among hundreds. In a pluralistic society, the reasoning isn’t hard to imagine. After all, wouldn’t it be horrible if our Muslim, Hindu, Buddhist and atheist neighbors, who are nice enough people, couldn’t go to Heaven with us? That just wouldn’t be fair, especially if they believed in their version of God. According to Burns, “This is the agenda of the universities at the present time because it is felt that maybe it is religion that has generated all the wars and so maybe if we can get rid of exclusive religion we might have greater peace in the world.” Could he be on to something? Could seminaries and schools of theological studies be transforming religious belief on such a grand scale to fit their agenda? The liberal bias in higher education, a self-reinforcing cycle, is especially pronounced in university religion departments. A recent study by Mitchel Langbert of Brooklyn College, found that, among 8,688 professors (with a Ph.D. and on tenure paths) from 51 of the top universities, Democrats outnumbered Republicans by a 10 to 1 ratio. But in religion departments, the ratio is an astounding 70 Democrats for every 1 Republican. Langbert points out that “Political homogeneity is problematic because it biases research and teaching and reduces academic credibility. Even though more Americans are conservative than liberal, academic psychologists’ biases cause them to believe that conservatism is deviant.” Within the university setting, dare to defend Biblical beliefs and traditional Christianity in many divinity schools and you may suffer consequences. Burns also points to a shift from finding truth in scripture to a view of truth as mere societal consensus, a sort of democratization of God in the postmodern age. “We are going wrong because we have moved the authority from Scripture to consensus. That’s where we are going wrong”. The apostle Paul, in meeting with the Ephesian elders, warned that men would arise within the church (“of your own selves”) “speaking perverse things, to draw away disciples after them” (Acts 20.30). It is the rampant deception that marks these Last Days, and it is being fulfilled among us, in spades. Note from Pastor Kevin Lea: In reference to the title of this article, I agree with the author’s use of “Christians” in quotation marks. One cannot be a true, biblical Christian without believing that Jesus is the way (only way), the truth (only truth) and the life (only source of eternal life). Those who think otherwise are calling Jesus a liar. Therefore, true salvation is predicated upon receiving Jesus as your LORD, and Jesus is certainly not the LORD of anyone who calls Him a liar. Recently, one of our church’s congregants left the church because during a sermon I emphasized that those who do not believe in the biblical Jesus will go to hell. The sermon in question was not the first time he had heard me teach this truth. But apparently he came to the point where he didn’t want to hear it anymore. I reasoned with him that I was only teaching what Jesus Himself had taught. But his emotions about those whom he considers to be “good people” being excluded from heaven on judgment day (because they reject Jesus as their savior) trumped God’s clear statements on the matter. I have warned him that this attitude is like saying, “If I were god I would do things differently” – which is all the same as saying that he has a better plan of salvation than the true God who so loved us that He sent Jesus as His salvation plan (John 3:16-18). We learn from scripture that this is the same mind-set that Satan had when he fell from heaven. It is becoming increasingly obvious that there is a sifting going on in the “church”. Could it be that as the day of the Rapture (1 Thes 4:17 – Caught Up) approaches, God is separating the true believers from those who only profess to be “Christians”, that is those who honor God with their lips but their hearts are far from Him (Isaiah 29:13). Becoming a true Christian is the result of a miraculous transformation of the heart which occurs when a person humbles themselves, repents from their sins against God and puts their trust in the fact that Jesus died on their behalf to save them from sin’s curse – which is spiritual death in hell. As a result of this biblical faith, they embrace Him as their LORD. The true Christian knows that Jesus alone is God’s rescue plan for lost sinners who are destined for hell apart from His saving grace. Once a sinner becomes a saint by God’s saving power coming into their life, there is no way that person can or ever will question whether Jesus is the only way to be saved. Those who do question have not experienced a heart change and are being deceived by the devil who is the enemy of their souls, and who tries to do anything he can to get humans to join him in his final abode. I pray the reader has embraced the biblical Jesus as your Lord and Savior, thus receiving His offered gift of forgiveness and everlasting life. If you have, then rest in this hope, keep your eyes on the prize and don’t get deceived by all the false Christians who believe doctrines of demons. Yes, their pundits and numbers are increasing as “the church” goes into apostasy, but it is better to be numbered among the faithful rather than “the crowd”. Let society accolade this “more tolerant” fake Christianity while they turn around and falsely label you as being a hater. Jesus promises to reveal all things when He returns and those who cling to the truth will rejoice forever when He does. Those who rejected the truth will weep and wail.